By hungry runner on November 4th, 2011 . Filed under: Holidays . I can’t believe how quickly the holiday season is approaching! All the stores are stocked with their holiday merchandise which means its time to start hunting for fun cupcake finds. This year is one of my friends first years having her own tree and she has already expressed a desire to have a themed Christmas tree. Have you heard of anyone doing these? Basically my friend wants to have a “sweet tree,” where all the ornaments, garland, and even the star on top is a dessert or candy. 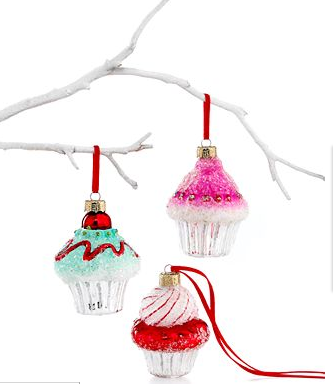 I think these Martha Stewart Collection Christmas mini cupcake ornaments which come in a box of three would be perfect for her tree. They are available from Macy’s for $17.00.